(1909) Daniel Haynes built this beautiful two story cypress wood home. 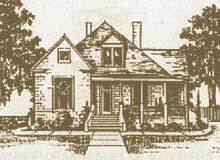 The September 3, 1909 Sealy Weekly News states that this was "one of seven (two-story) homes and a total of sixty-five built in town and the farming district of Sealy this year." Completed in 1911 for civic leaders Paul and Mahala Hackbarth, this concrete block house is an unusual example of vernacular architecture. Prominent features include a wraparound porch, ionic columns on piers, and large wood sash windows. The Hackbarth Lumber Company, one of the earliest businesses in Sealy, promoted the use of concrete blocks for local buildings. This house is a fine example of the vernacular construction method. 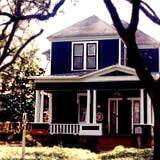 This home built in 1895 by Dr. James W. Bostick, was originally a four room cottage. The second story was added in 1907. The home is seen here traditionally decorated for the Fantasy of Lights Festival occurring the first Saturday in December. As a young man Martin Allen assisted his father, Benjamin, in surveying roads in their native state of Kentucky. He married Elizabeth Vice in 1804 and by 1810 they and their three children were living in Louisiana. Martin joined the Guiterriz-Magee expedition's bid to rid Texas of Spanish rule in 1812-1813. His father and nephew were killed at the decisive battle of Medina. Martin, on a recruiting mission at the time, survived. After a brief stay in the Arkansas territory, the Allen's moved back to northwest Louisiana and around 1818 settled in a community which shortly thereafter was named Allen's Settlement in Martin's honor. In 1821 Martin traveled to nearby Wharton County as one of Stephen F. Austin's "Old Three Hundred" colonists. Martin was among the first settlers on the Colorado river. About 1834 the Allen's purchased land in Sealy at Eight Mile Point (so named for its distance from San Felipe de Austin) from their son, Miles. The Allen's lived on this property for the rest of their lives. Allen family members operated a "public house" approximately 1/4 mile East of Sealy. Future hero of the Alamo, William B. Travis was a frequent guest of the Allen's. Martin, a Texas War of Independence veteran, is buried near the "public house" in the Allen family cemetery.